You can easily add texture to any needlepoint project by working the simple decorative brick stitch. The technique is so flexible; it can be worked in any direction—although it is usually made horizontally or vertically to imitate the look of a brick wall (hence its name). Similar to the Long Stitch or Bargello technique, the straight and upright Brick Stitch typically requires more plies or strands of thread in the needle than when working diagonal stitches. Two few plies make for poor thread coverage, causing the needlepoint canvas to show between stitches and the needlework to look sloppy and poorly made. Large background fill areas - Work the stitch over two or more even numbers of canvas threads to quickly cover large open areas surrounding a design motif. Compensating stitches for small areas - Depending on the shape of the needlepoint design, there may be a few small spots where a full stitch used to work the main design element cannot be completed. Small brick stitches can often be used to "compensate" and cover any remaining canvas threads. Anywhere a decorative stitch can be used for effect - The Brick Stitch is regularly used when making Christmas needlepoint items. Its textured appearance looks great on tree ornaments, Santa motifs, and other holiday needlepoint designs. Considered by some needlepoint experts to be part of the Gobelin family, the Brick Stitch is definitely more interesting and fun because the stitches are usually shorter and their placement varies by row as they are worked on the even grid of the canvas. It is recommended that you work the Brick Stitch only on mono needlepoint canvas as the spaces between the pair of mesh threads in Penelope or double-thread canvas are too far apart to work this stitch technique effectively. When using Brick Stitch, it is very important to establish a smooth working rhythm with consistent tension. The back of the needlepoint canvas should have long flowing stitches that cross more than one canvas thread to ensure proper coverage. Start at any place on the design area where you plan to place the Brick Stitch. Begin working the stitch by bringing the tapestry needle up at the target hole at (1) (see top right corner of above image). Go over two horizontal canvas mesh threads and down back into the canvas at (2). Skip two vertical canvas mesh threads and come up at (3). Go down at (4) to complete the stitch. Continue in this manner working from right to left across the row. Work the stitches on the next row in between the ones you placed on the previous row. Begin each stitch by coming up halfway from the start of the ones you made in the previous row and work over two vertical canvas threads. Continue to make the stitches across the row by either working from left to right across the row; or by turning the canvas around and working from right to left. To complete the background or design area with Brick stitches, continue to work Steps 1 to 3 until the entire area has been filled. Double Brick Stitch - This variation is quite easy to make. It consists of two identical Brick Stitches placed side-by-side with four horizontal canvas mesh between each pair. 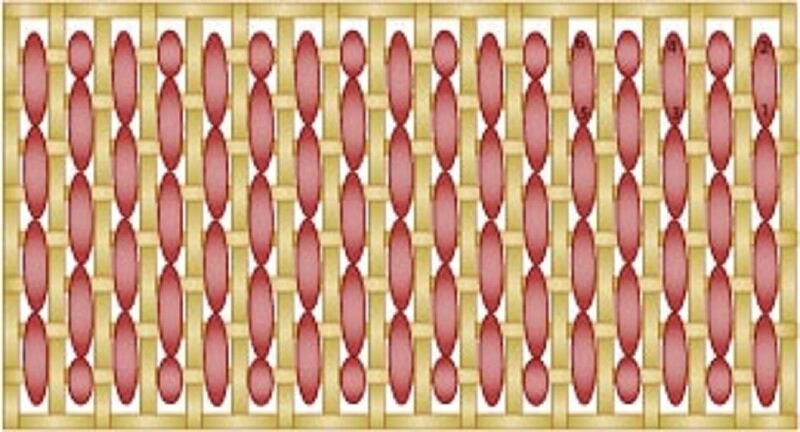 Elongated Brick Stitch - This stitch is made by working the stitch over four or six vertical canvas mesh threads. When made over four threads, the stitch is still quite decorative and very sturdy; however, caution should be taken when going over six threads as the stitch could easily snag and pull out of shape. Horizontal Brick Stitch - Made the same way as the basic Brick Stitch, except over horizontal canvas threads with vertical threads left vacant in between.